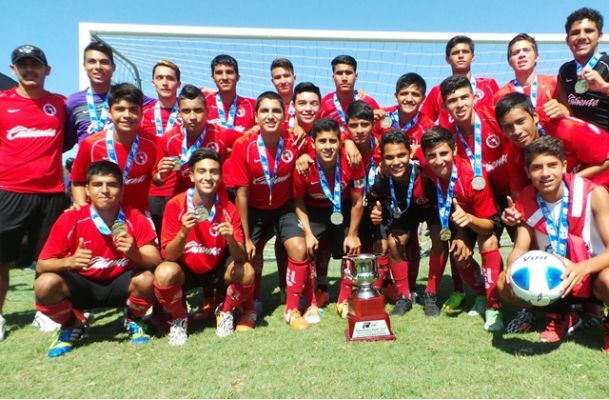 DEL MAR, Calif. –Club Tijuana Xoloitzcuintles de Caliente continues with its success with its youth teams at an international level. The Xoloitzcuintles Under-15 and Under-16 teams won the San Diego Surf Cup final of their respective group Monday July 28. Both teams beat their opponents 3-1 to claim the organization’s first championships in the international tournament. The Under-15 team beat Houston Express of Houston, Texas 3-1 in the Super U16 category final with goals by Abraham Negrete, Jorge Topete and Arturo Martinez. Coach Idelfonso “Pichus” Mendoza’s team finished the tournament unbeaten (5-0-0) while outscoring its opponents 11-2. The Under-16 team coached by Marco Marroquin finished the tournament in similar fashion in the Super U17 category. The Xoloitzcuintles beat South Bay Gunners of Lawndale California with goals by Daniel Gonzalez scored in the first half while Brandon Monteon sent in a pair of goals in the second half to seal the win. Marroquin’s team also finished unbeaten (5-0-0), outscoring its opponents 10-1. Club Tijuana did not allow a goal in the group stage (three matches). The San Diego Surf Cup is a highly regarded tournament featuring some of the best youth clubs in the United States. More than 450 college and university scouts attend the three day tournament.